In the latest exchange of threats between the US and North Korea last Saturday, North Korea’s foreign minister Ri Yong Ho has told the UN general assembly that firing its rockets at the US mainland was “inevitable” after Donald Trump called Pyongyang’s leader Kim Jong Un “rocket man”. He also suggested a nuclear test over the Pacific Ocean would be an appropriate response to Trump’s recent comments. Earlier that day, US air force bombers flew east of North Korea, the farthest north of the demilitarized zone separating North and South Korea that any US fighter jet or bomber has flown in the 21st century. 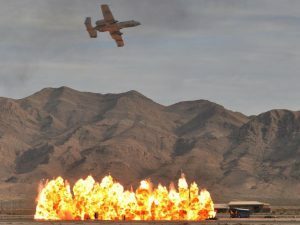 “This mission is a demonstration of US resolve and a clear message that the President has many military options to defeat any threat,” said Pentagon spokeswoman Dana White. One day later, a huge new military exercise involving thousands of troops, ships and fighter jets has been launched in Scotland to practise shooting down nuclear missiles. At least nine states now have nuclear weapons, the latest being North Korea, as confirmed last July, after the country tested nuclear missiles for the first time. So far Trump and Kim are battling the war of words, but how long until the tensions quite literally explode? Trump gave a hostile speech at the UN summit in which he said that if provoked, the United States “will have no choice but to totally destroy North Korea.” Moreover, he called the North Korean leader “Rocket man, on a suicide mission for himself and his regime”. 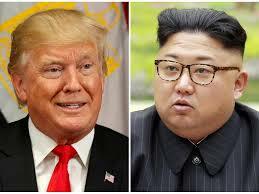 In turn, Kim called Trump a “mentally deranged US dotard” and said he would “pay dearly” for threatening to destroy his regime. North Korea has launched dozens of missiles this year, several of them flying over Japan, as it accelerates a weapons programme aimed at enabling it to target the United States with a nuclear-tipped missile. Tensions have continued to rise around the Korean peninsula since Pyongyang carried out its sixth nuclear test, prompting a new round of UN sanctions. China, one of the main economic and trading partners of North Korea, has been reluctant so far to strictly implement crippling measures that might destabilize the region or lead to the collapse of its ally. Yet, they agreed to limit exports of refined petroleum products from 1 October and ban exports of condensates and liquefied natural gas immediately to comply with the latest UN sanctions. It will also ban imports of textiles from North Korea. However, putting the country under economic pressure has not had a restraining influence so far. If a nuclear war happens, millions of tonnes of smoke would gush into the stratosphere, resulting in a nuclear winter that would lower global temperatures for years. The ensuing global crisis in agriculture – a “nuclear famine” – would be devastating. Finding a diplomatic solution will not be easy, especially because it requires tackling intertwined and incompatible national interests. Although difficult, dialogue seems to be our best hope for peace.